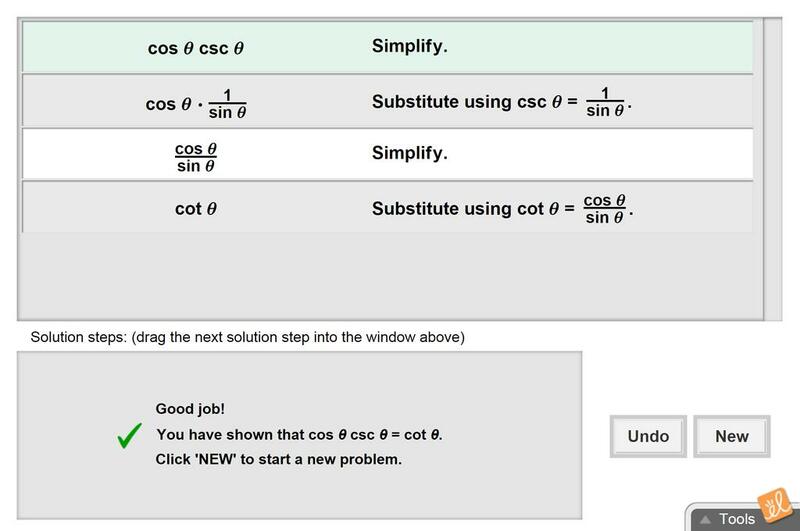 Choose the correct steps to simplify a trigonometric function. Use step-by-step feedback to diagnose incorrect steps. This document is the French translation of the Student Exploration Guide for Simplifying Trigonometric Ex... (more)pressions. This translation was made possible by Alberta Regional Professional Development Consortia and ExploreLearning. This document is the French translation of the Assessment Questions for Simplifying Trigonometric Express... (more)ions. This translation was made possible by Alberta Regional Professional Development Consortia and ExploreLearning. Very fun for students. Mine really enjoy guessing the next steps. Great for helping students see steps in simplifying trig expressions. Excellent and fun way to simplify trigonometric expressions!